Romeo and Juliet made its first print appearance in 1597, thanks to the efforts of the printer John Danter. 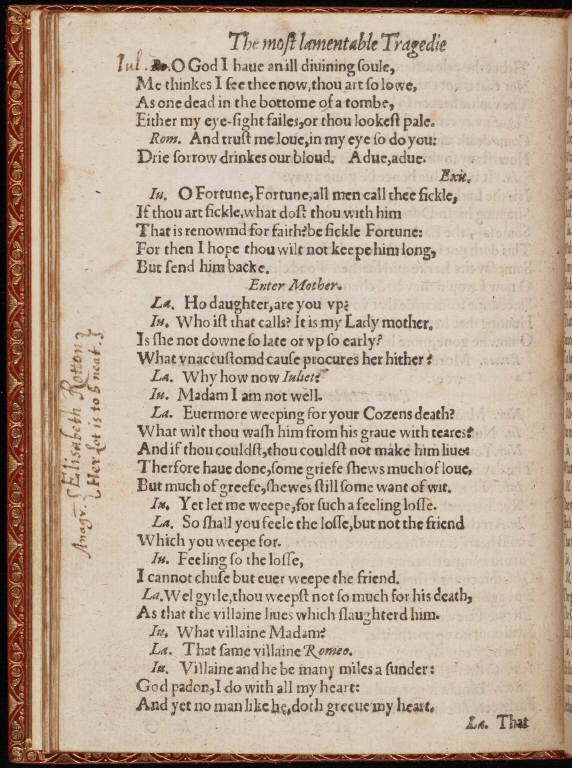 Danter oversaw the first printing of a Shakespeare play, Titus Andronicus, in 1594, and the first quarto of Romeo and Juliet followed a few years after. Two years later, though, another printer would produce a quarto of Romeo and Juliet that would leave Danter’s somewhat obsolete. 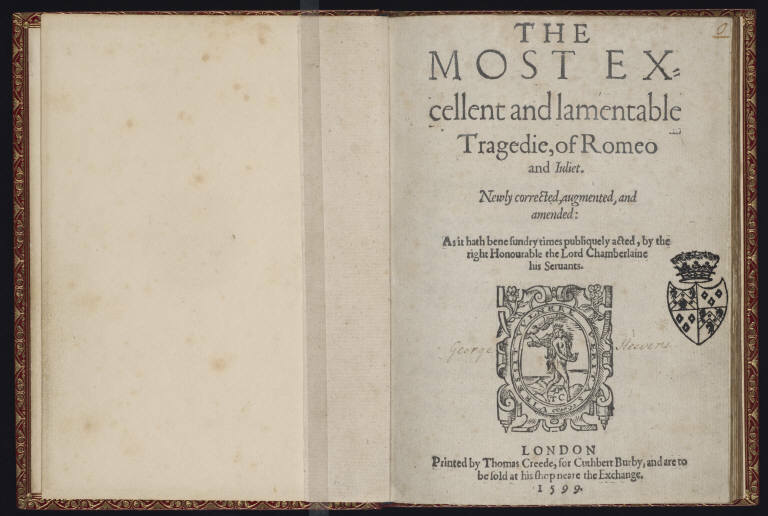 The second quarto, printed by Thomas Creed in 1599 and pictured above, represents a considerable expansion of Danter’s original edition, as its sub-title announces: The Most Excellent and Lamentable Tragedie, of Romeo and Juliet. Newly corrected, augmented, and amended: As it hath bene sundry times publiquely acted, by the right Honourable the Lord Chamberlaine his Servants. The augmentations advertised by Creed’s second quarto amount to about 800 lines of text, as well as reconfigurations of the dialogue in several scenes. Creed’s amplification, however, was not without its errors; in this, he was representative of many early modern printers, who were frequently forced by time constraints to read broadly but roughly, proofreading when possible but only, it may be surmised, to the point of sufficiency rather than of perfection. 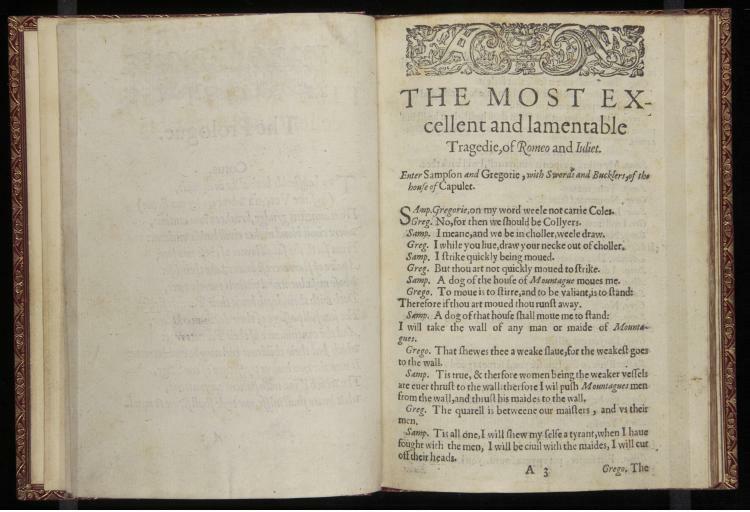 Elizabethan readers had their own varying levels of attention when it came to reading, paying attention to the pamphlets they purchased in ways that were frequently different and less occasionally similar to our own. “Elisabeth Rotton,” wrote the quarto’s first owner across one of the pages, “Her lot is to b neat”—an early modern anagram. Anyone every remark on the coincidence of the Elizabeth Rotton anagram to another anagram on a memorial brass of Elizabeth Rotton (d. 1638) in St Laurence Church, Meriden, Warwickshire?